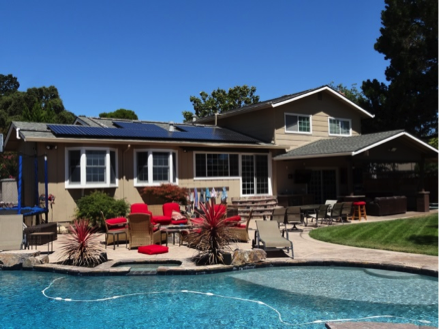 Solar heating for family pools is a proven technology. Water from your swimming pool, after going through your pump and filter, is sent to solar panels and then returned to the swimming pool. Using solar energy warms your swimming pool without the cost of a gas heater and lengthens your swim season by months! It’s easy and it works. The sun furnishes the energy to heat a pool so you may enjoy swimming from Spring to Fall, earlier in the mornings, and later in the evenings! Too many people pay for the upkeep of a swimming pool and get very little use out of it, simply because they’re unhappy with the temperature. Heliocol solar pool heating enables you to take full advantage of a long swim season and perfect water temperatures! Solar pool heating is a strong, ecologically advanced solution that enables a family to experience a swimming pool more than ever before! For more information about solar pool heating in Walnut Creek connect with Solaron at 916-631-9293.